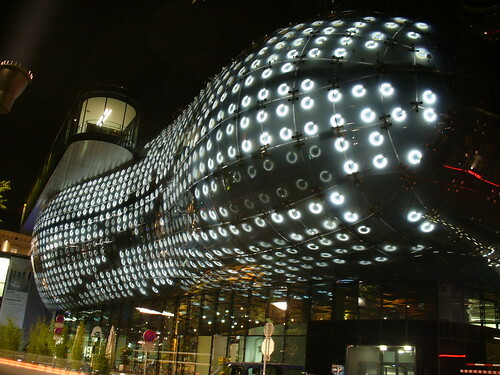 “The fact is, contemporary architecture gives most regular humans the heebie-jeebies. Try telling that to architects and their acolytes, though, and you’ll get an earful about why your feeling is misguided, the product of some embarrassing misconception about architectural principles. One defense, typically, is that these eyesores are, in reality, incredible feats of engineering. After all, “blobitecture”—which, we regret to say, is a real school of contemporary architecture—is created using complicated computer-driven algorithms! 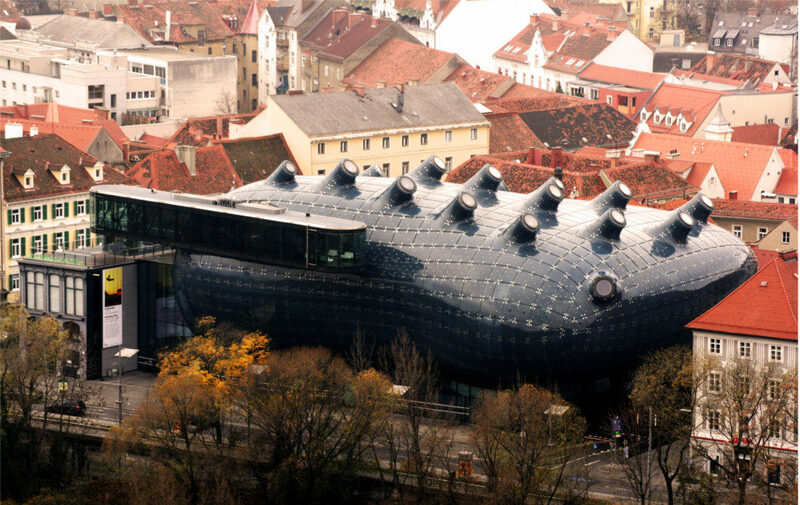 You may think the ensuing blob-structure looks like a tentacled turd, or a crumpled kleenex, but that’s because you don’t have an architect’s trained eye. Another thing you will often hear from design-school types is that contemporary architecture is honest. It doesn’t rely on the forms and usages of the past, and it is not interested in coddling you and your dumb feelings. Wake up, sheeple! Your boss hates you, and your bloodsucking landlord too, and your government fully intends to grind you between its gears. That’s the world we live in! Get used to it! Fans of Brutalism—the blocky-industrial-concrete school of architecture—are quick to emphasize that these buildings tell it like it is, as if this somehow excused the fact that they look, at best, dreary, and, at worst, like the headquarters of some kind of post-apocalyptic totalitarian dictatorship. Last edited by KC; 04-11-2018 at 08:23 PM. Much of the architecture built in the past 50 years is brutally ugly with huge expanses of industrial materials and architects convincing us that their 'vision' of modern is far better than, classical designs that incorporate more integrated details and eye pleasing forms, with overly simplistic ideas and mish-mash elements that resemble something designed by a committee that could not agree on anything. The lead photograph is an example of an architect wanting to make a 'statement' with no concern for the surrounding community, that looks more like a diseased internal organ. We have our share of ugly buildings and I hope that some people will read this well written article and realize that we can do better. Don't get me wrong, I love some of the new buildings and recent architecture. But when architects want to create a signature design it should not be the artistic equivalent of graffiti vandalism. "Let’s be really honest with ourselves: a brief glance at any structure designed in the last 50 years should be enough to persuade anyone that something has gone deeply, terribly wrong with us." "For about 2,000 years, everything human beings built was beautiful, or at least unobjectionable." The author also failed to recognized that's most of the incredible historical structures were most likely built through some form of slavery affording the structures existence. In current time and cost, good luck. I'm not sure if you and the authors are talking about the same kind of architecture. They seem to be talking about brutalism, and possibly other branches of modernism(eg. the International Style), whereas the diseased organ in your photo isn't really like that at all, and seems to me, at least, rather post-modern. For Edmonton reference, the CN Tower would be an example of the International Style, the courthouse an example of brutalism, and I'm not exactly sure what would be an example of post-modernism. Last edited by overoceans; 05-11-2018 at 09:03 AM. By the way, what IS that building? The diseased organ, I mean. I actually really like it. Thanks for the post. The article confuses "contemporary" with "star-citecture". Contemporary architecture, for the most part, is rather, banal and useable and easy to digest. Like most of-the-time contemporary architecture. Cute article though. I kind of like the "blobs", though it seems like there is an awful lot of interior space than can't be fully utilized due to the unusual angles. I don't mind lots of exposed concrete or stucco on large residential or office buildings. What I hate is when brutalism is shrunk to small scale and you get square box houses that look like overgrown shipping containers. Use all of the cheap, nondescript vinyl siding you want, just give your house a proper attic or cathedral ceiling. Interesting article, but not sure why they ignored probably the most obvious reason, it's simply too expensive. Now that we pay workers living wages, we can't typically afford intricate ornamentation, so we have to resort to using form to keep buildings visually interesting. i think the "cost of intricate ornamentation" is probably less expensive today than at any time in history regardless of how you want to calculate it. it's lack of use has absolutely nothing to do with workers being paid "living wages" or not. the availability of different materials and fasteners and manufacturing techniques from computer controlled routers and break machines to 3d printing should, if anything, make today's architecture the forefront of intricate ornamentation. my personal thoughts as to why we see less rather than more ornamentation is a lack of design expertise and skills combines with an unwillingness to spend the design time, not an unwillingness to pay for the labour, that is the root cause. as for form being a useful resort to keep buildings visually interesting, how much time does anyone you know spend gazing on hall d's form as an object of admiration or a source of inspiration? That is very true. If you look at much of the "intricate ornamentation" in old buildings 100 years, 200 years and even 500 years old, much of it was mass produced and available 'off the shelf'. There were catalogs of features that builders used from standardized designs and drawings that were produced in quantities and delivered to towns and villages were Churches and building were being constructed. Molds were reused again and again to make interior details out of plaster and then finished to look like stone. 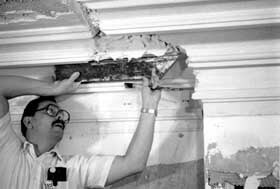 Coves, cornices and mouldings are often made from plaster and templates dragged over the surfaces to make the details. The photo reveals the creation of a mold for plaster ornament for the Columbian Exposition of 1893. The artisans in the photo are sculplting a full size clay positive of the ornament. When complete, it will used to create a mold that the final plaster will be poured into. You can see identical church steeples, columns and details in Churches all over central Europe that were made in plaster studios. When I toured Europe last year, we were shown how 400 year old architectural flourishes were made from plaster in factories or on site from molds and then assembled in multiples to create complex lace and lattice work, capitals and other details. On site they are lifted to the ceiling and plastered to the walls. Often what appears to be marble or stone columns are actually plaster covered brick or stone, faux painted and only upon close inspection can you see that it is painted plaster. Later they cast details in iron especially for outdoor use. Sculptures were copied using pantographs and templates to make copies by production methods. Last edited by Edmonton PRT; 05-11-2018 at 06:20 PM. ^Interesting. I didn't know that, thanks. ^^Very true, but isn't the unwillingness to spend the time on design also tied to cost? Architects aren't cheap. And I don't think form is a good replacement for ornamentation, just that that is what seems to have happened. And having some experience in an architecture firm, I think the design process may be part of the issue as well. Everything seems to focus on the larger scale, and with 3d models and renderings everyone gets caught up with how it looks from far away, and the human scaled elements are largely an afterthought (imo). You'll see thousands on renders of buildings around the office from far away, but never anything that focuses on the detail elements. Oraments would naturally have some production form even back then. While cheap to produce, does/will that equate to cheap cost to build? Interesting article on sideways skyscrapers and why they all look the same.